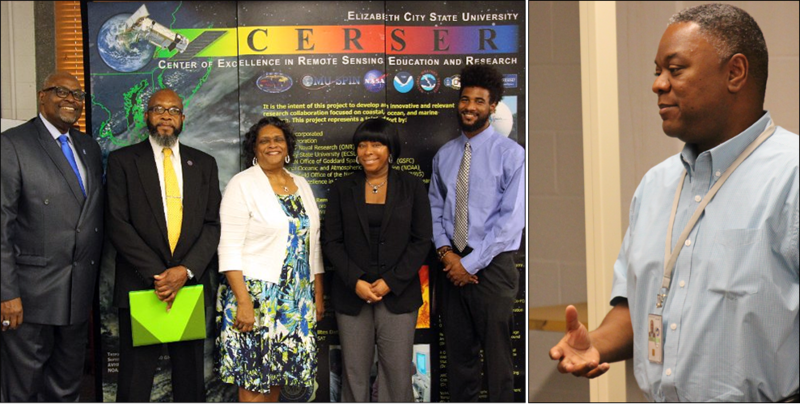 On August 22, 2016, the Pathways in Mathematics Education and Remote Sensing (PiMERS) at Elizabeth City State University (ECSU) welcomed NASA Minority University Research and Education Project (MUREP) representative Ms. Misti Moore. Ms. Moore, NASA Johnson Space Center MUREP manager, was able to spend time with ECSU faculty and staff discussing the PiMERS project and ECSU’s interaction with NASA. Tours of the Aviation Science Department, Pharmacy Program, and the Math & Computer Science Department were given to the visitors to the campus. Dr. Vann Newkirk, ECSU Provost and Vice Chancellor Academic Affairs, welcomed the visitors to the campus and Dr. Linda Hayden, the PiMERS Principal Investigator, along with Dr. Darnell Johnson, PiMERS Education Coordinator, provided information regarding the PiMERS project at ECSU. Ms. Jessica Hathaway & Mr. Jefferson Ridgeway, NASA Langley Research Center (LaRC) student interns, provided overviews of their recent internships at NASA LaRC during the summer of 2016. The morning session was concluded by Mr. Ron Chappell, Executive Director of HBCU Direct, LLC, a marketing collective specializing in HBCU relations which is currently promoting internships at NASA Langley Research Center.